► BPA Free & Eco-Friendly for the Environment. ► Prefect Gift Guarantee! Keep you Love Ones Healthy and Safe - NEVER FORGET AGAIN. ► 8" x 3" Size to fits all major pills size. .
► The Efficient Design and variant colors system placed in the kitchen/bedroom or dinner table help you to NEVER FORGET to take your medications again! Product Choices One Month Pill Organizer System maintain and track your Medications intake. Each days of the month will have 2 slots - AM & PM. Also, each 4 days of the month is a different transparent variant colors so you will NEVER FORGET to take your medications again. Product Choices One Month Pill Organizer 8" by 3" should be more than enough storage for all your majors' pills or vitamins for the Whole month with an EXTRA FREE Pill Cutter if needed. Buy with Confidence since Product Choices offer a 30 Day NO QUESTION ASK return policy. Don't Hesitate, Buy It, Try It, If you don't like it Return it - PERIOD! Keep away from baby and children. ALWAYS REMEMBER - Forgetting your meds is a thing in the past. With our 8 variant colors and eye-catching pill organizer, you will always remember to take your meds. It is easy to miss your pills, to skip doses, or even to overdose, especially for seniors. Stay healthy and avoid such an accident only by keeping your medication in order. Designed with ease of use in mind, this device will eliminate the hassle of remembering what medications to take. WORTH IT! 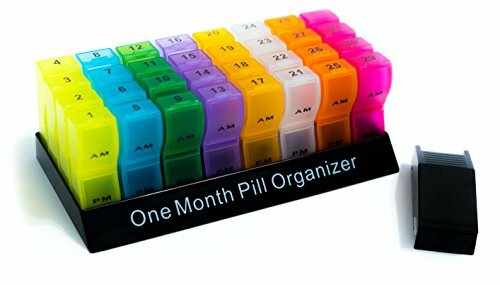 - This One Month Pill Organizer design with its variant colors system will help you keep tracks of your daily medication intake. One individual slots with AM/PM for everyday of the weeks for 31 Days + 1 extra slots and 1 FREE Pill Cutter - All made from high quality plastic material. PERFECT FOR LOVE ONES - Be the one who cares by giving this One Month Pill Organizer to your loves and they will NEVER forget to take medications again. This is a Perfect Gift for your Grandparents, Parents, Families, Friends or Teens to stay safe and healthy. If you have any questions about this product by Product Choices, contact us by completing and submitting the form below. If you are looking for a specif part number, please include it with your message.